The New Hampshire Bio/Medical Council provides information and/or assistance to Life Science companies as well as companies within the industry relocating their operations to New Hampshire. 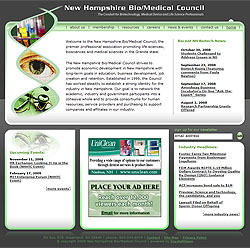 As a non-profit organization with an all-volunteer board of directors, the New Hampshire Bio/Medical Council needed a web site that would more effectively market the council to potential members. The NHBTC board required a web development firm that could create an artful and easy-to-use medium, which, in the initial stages, would generate new membership within a branded online interface. The new site needed to provide information about the organization and its board members, the benefits of membership, the resources available to those in the Life Science markets, as well as current industry news and regional events produced by the council. The NHBTC directors also wanted a firm that would continue to collaborate with the council on incorporating additional online member services and further enhancements to the NHBTC web site throughout a comprehensive series of phases. Before initiating the design and development of the New Hampshire Bio/Medical Council's web site, CrystalVision met with the board of directors to fully assess the goals of the Council. It was unanimously agreed that in order for the NHBTC to attain their online goals the project would be developed in progressive stages through the long-term commitment, collaboration and partnership of both parties. The project was initiated with the development of a new council logo. The new logo is easily recognizable, encompasses all markets within the Life Science industry, and further promotes the consistent branding of the council. Once this preliminary step was completed, CrystalVision established a clearly defined infrastructure and began development of the web project. The launch of the preliminary web site enabled the volunteer board to more effectively communicate to potential new members thus increasing member enrollment and participation at council events. Shortly after launch, CrystalVision programmed a "BioTech News" page accommodating a new alliance between the NHBTC and BusinessWire. This page acquires a direct feed from BusinessWire of the regional Life Science news stories, further positioning the NHBTC as a reliable resource for current and potential members. The index page was configured to include banner advertisement space. The 2007 launch of a job posting application further contributes to the functionality and usefulness of the web site. Future stages will include additional applications and enhancements which will further market the NHBTC, build brand awareness and promote membership. Since the launch of The New Hampshire Bio/Medical Council web site, the state of New Hampshire has enjoyed an influx of biotechnology businesses and new careers resulting in millions of dollars in revenue. The profile of the biotech field has grown considerably, and the site is among the top attractions for those working in the industry. With the employment opportunity application increasing in popularity, the web site is poised to become the premiere source for job hunters and employers in the biotech field.